Meadow Story is rated 3.8 out of 5 by 16. Rated 5 out of 5 by odarney from So Happy to See TM Games Like This One My favorite are the TMs; you can play them over and over again and not necessarily remember the best way to the play the level. At the end, you can just restart the game. MEADOW STORY has SO MANY LEVELS. Some are really tough! I would greatly recommend this game. Rated 5 out of 5 by jaragr from Fun Game! I love this game! It's one of those that is not easy to get 3 stars. You really have to use strategy. I got 3 stars on every level except level 15, and I tried many, many times on that one. A really fun game! Rated 5 out of 5 by biscuitsmama from A WONDERFUL LIGHTHEARTED AND RELAXING TM GAME Meadow Story is a TM game that I have been waiting for. I know that some gamers will think this is a childish or very easy game but for those like me who are fairly new to the genre I find this a perfect game. Yes I have some other TM games that I really like but for me this is a fun and happy game. The graphics are bright and really cute. I love the pace of the game and find it easy and relaxing to play. 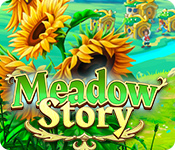 If you are new to playing games here at BFG and would like to try the TM genre of games then I highly recommend that you give Meadow Story a go. It is not too difficult for those who are new to playing TM games and even for some TM veterans it is perfect for when you don’t want an overly challenging game. 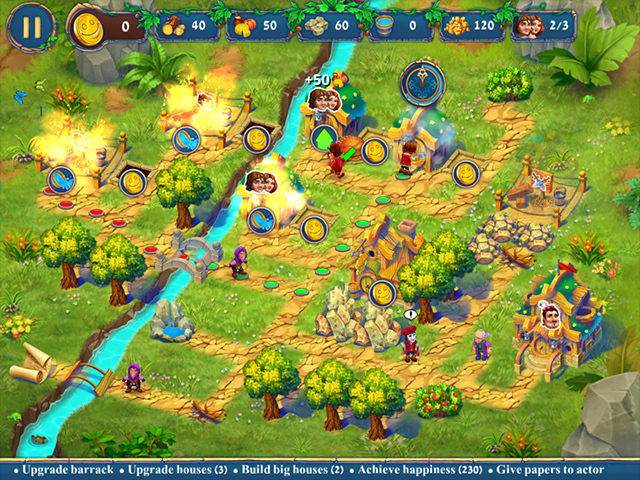 I have found it fun to collect resources and to build a new town for the Halflings. When I play TM games I always choose the easiest mode of gameplay as I am not yet comfortable with playing a timed mode. As always, please download the demo to see if Meadow Story is a game you will enjoy. Happy gaming! Rated 5 out of 5 by iloverainbows from Just me out in the desert kicking the sand around and moaning. There was a problem with level 24 and don't ya' know Big Fish came through with a fix. The game starts out a bit slow and seems fairly easy. But, don't be fooled. It gets into some rough going out in that desert. The usual clearing roads, building, gathering and with a twist. 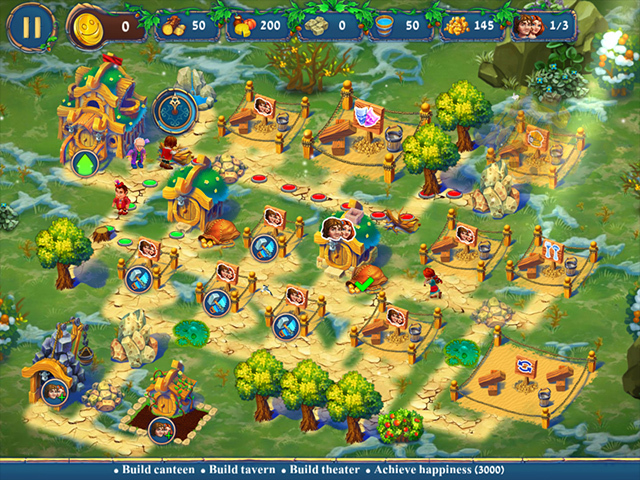 There are artifacts collected and bought to help you with the next level. So I put the update on it and covered my mouth and nose with a scarf and trudged back out in the desert and found myself laughing my way through this game. Some levels are hard and I did have to repeat them to get the stars. This is a sit back and enjoy. OH OH OH...you will learn what a boom pipe is. ROFL This is the very first real review I have given and want to thank all of you at Big Fish for fixing the problem so fast. I truly enjoyed the experience...and have decided deserts are really not my cup of tea. Rated 5 out of 5 by Tennesseekidd from I love this game. Finally you are getting time management games I dislike the hidden object games. So two time management in 3 days is cool. Rated 5 out of 5 by dgriffith from A Great Little Gem of a Game! 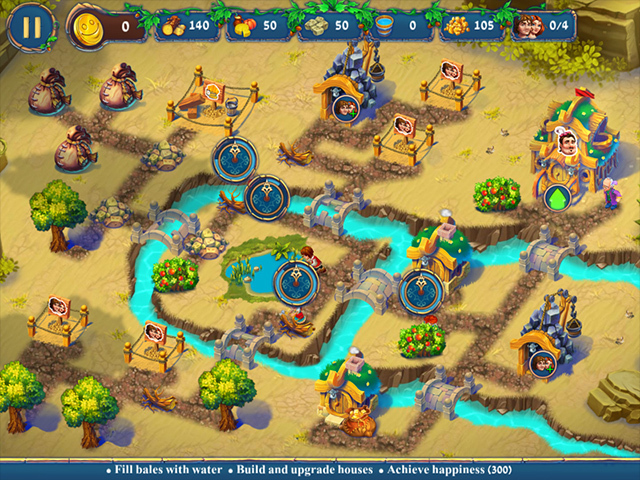 This is a really fun TM/Strategy game. There are 3 modes to choose from and I chose "Normal". At first, it seemed easy enough and I was getting 3 stars on each level...but then when I hit level 9, it became more challenging and I was only able to obtain 2 stars on the levels...it was at that point that I clicked the "buy" button! I happened to have a PCC so I used that to buy the game. The characters are cute, the music is pleasant and the goals are pretty plainly laid out for you. I'm having quite a bit of fun playing it and it was just the game I needed to brighten my spirits! I'm currently snowed in with over 2 ft of snow and more on the way. Perfect excuse for playing this gem of a game! Rated 5 out of 5 by Isator from cute TM this one reminds me of other TM games put together. it is so much fun and keeps you playing. Rated 5 out of 5 by joybelle_1 from Another Quality TM At risk of the review not getting up, I can sum this game up very quickly. Elven Legend meets Royal Envoy! There are 3 modes of play including relaxed. Its a super cute, very clever collect resource game. You will build sawmills and markets, you will upgrade houses with gardens for happiness as well as calling into the tavern and attending performances. You will sow and reap crops. Gold is collected by workers from the Town Hall. Bonuses come in the form of various characters you hire..a cobbler for speedy boots etc. You click on the person to activate. Its clever, its cute but it is not very stressful. Perhaps its the pleasant fairytale like graphics that are calming? But there is strategy involved and I repeated some early levels till I worked it out To sum up. A good lighthearted standard TM that is a pleasure to play. Enjoy! Rated 3 out of 5 by pennmom36 from I DON'T WANT TO SETTLE FOR ORDINARY WHEN EXTRAORDINARY IS OUT THERE For me personally, this game pales in comparison to some amazing TM game releases we've been offered lately. It's a cute game but the tasks are the same tasks as all the other ordinary TM games out there, it has ordinary tasks and the same berry bush picking scenario. The graphics are decent but there's just nothing offered here that makes the game stand out from all the other ones, it looks and plays the same as hundreds of other TM games. If you're just looking for another TM game to play it works, but if you're looking for a challenging game with unique features I think you'll be disappointed. You can play in a Relaxed, Normal or Professional Mode of Difficulty, which is a good thing, and it has a decent length of 40 available levels. The graphics are somewhat better than most, and available tasks are circled with color-coded rings such as Green when you have all the requirements and sufficient workers. Unfortunately, it has all the usual resources of picking up pre-cut logs, chopping down trees for lumber, picking berry bushes to feed the workers, clearing the beaten path of obstacles, repairing and/or upgrading Farms, Sawmills etc. The only feature somewhat unusual is receiving Bonuses that go along with the Characters such as the Cobbler making shoes that make the workers run faster. Every aspect is exactly as you'd expect in a TM game. I love Growing Grass Studios, and this isn't a horrible game, it's just a predictable game. I loved all the different features and unusual aspects of the last TM release, so I guess I'm just to the point where I expect different offerings and don't want to have to settle for ordinary now that I know extraordinary exists. Rated 3 out of 5 by JeansLady1 from One really irritating thing for me This is a middle of the road, okay TM game. It's not the worst, but not the best. Graphics are good, tutorial is also good. I played a few levels and bought it since there was a good sale so I could complete my punch card; but would never pay full price for it. There is one thing that drives me up the wall to the point that sometimes I have to mute ALL of the sounds. Every time you click on something, the worker will reply with something like "okay" or "wow" or "humm" and a few other unnecessary utterances. Making a comment now and then is okay, but not every single time you click on something for a worker to do - especially when you are running multiple workers. I know I'll finish it at some point in time, but because of the constant chatter I'm sure I'll play it for shorter periods of time between other games when I want to switch from one game to another for a change of pace. I'd give it a 3.5 star rating if one was available. I am recommending this game because other than the annoying constant chatter, I can play and enjoy it. The BF intro says they are a "joyful little tribe." They are, in reality, total chatterboxes.